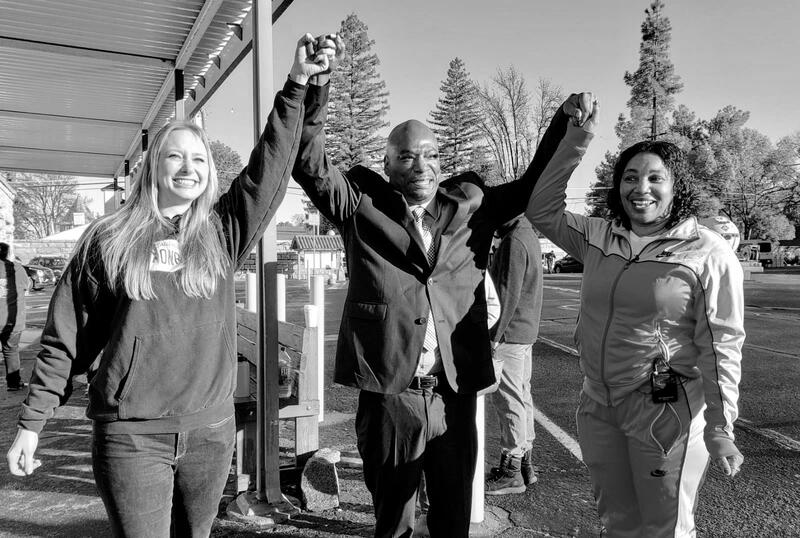 UPDATE: Quintin Morris Freed From Prison After 27 Years of Wrongful Incarceration! Little did Quintin “Q.T.” Morris know, but the beer run he volunteered to go on for a party running low on alcohol would turn into his last night of freedom. Shortly after midnight on November 30, 1991, four teenagers returned from a double date. As they walked up the stairs to the house, a white Cadillac driven by Claude Davis pulled up and Howard Holt got out of the passenger side of the car. He was wearing a knee-length black jacket and a stocking mask that covered both his face and neck. He stood about thirty feet away from the group and opened fire on the teenagers. Howard, in a fit of road rage, was retaliating against the teenagers who had cut them off. Howard then jumped back into the car and Claude sped off, tires screeching, in the direction of the freeway. Police in the area immediately responded to the scene and put word out to look for a white Cadillac in the area. More than five minutes after the shooting, police discovered Q.T. and a friend, Harlan Morgan, waiting patiently at a red light in a yellow Cadillac only a block or two from the crime scene. They were on their way to the liquor store to buy more alcohol for a party they were attending. Despite the fact that witnesses saw a white Cadillac speeding from the crime scene and at least five minutes had already elapsed, police detained Q.T. and Harlan. Q.T. and Harlan were cooperative with police. Police searched Q.T.’s car, but found no guns, no bullets, and no stocking mask. Thinking Q.T. and Harlan could have thrown the items from the car, police searched the surrounding neighborhood but also found no guns, no bullets, and no stocking mask. Despite the lack of any physical evidence connecting Q.T. and Harlan to the crime, police placed them in handcuffs and detained them by Q.T.’s yellow Cadillac. In a completely suggestive identification procedure, police brought two of the teenagers to the Cadillac. One of them identified Q.T. as the shooter. This identification did not make sense given that Q.T. was the driver of the Cadillac, not the passenger. Further, Q.T. was wearing a waist length jacket, whereas other witnesses described the jacket as knee or thigh length. Nevertheless, over time, this witness became ever more confident in her identification. At trial, she exaggerated what she saw, claiming that the shooter stood only eight feet away from her and, despite being showered with bullets, she stood up in a moment of strength and glory and looked the shooter directly in the eyes. She claimed she clearly could see him through the stocking mask even though it distorted his facial features. Based on this evidence, a jury convicted Q.T. Q.T.’s conviction was disturbing to the trial judge – Judge Michale Hoff – a conservative judge and former police officer who used to work the area where the crime occurred. Judge Hoff expressed “grave concerns about the sufficiency of the evidence” against Q.T. Several times during trial, Judge Hoff even tried to convince the Los Angeles District Attorney to drop the charges against Q.T. After his conviction, it was not long before Q.T.’s appellate attorney discovered who the true culprit was – Howard Holt. Howard had just been convicted of a number of similar shootings that happened around the same time and, indeed, he drove a white Cadillac. Howard confessed to the appellate attorney and to the Judge Hoff. Judge Hoff reversed Q.T.’s conviction, noting that it was now clear Q.T. was innocent. This good news lasted only minutes. The Los Angeles County District Attorney appealed the exoneration and won on appeal. The Court of Appeal determined that Howard’s confession could have been presented at Q.T.’s trial and, therefore, Q.T. was precluded from bringing it to the trial judge’s attention after he was convicted. Further, the Court of Appeal determined, despite overwhelming physical and scientific evidence to the contrary, that witness identification of Q.T. was strong. On federal review, a federal judge noted that his hands were tied and he could not reverse Q.T.’s conviction because there were no “legal avenues to do so.” The judge expressed serious concern over whether Q.T. committed the crime and suggested that Q.T. specifically apply for a pardon from the governor. The California Innocence Project became involved in Q.T.’s case and commenced an investigation into his claim of innocence. In doing so, the California Innocence Project tracked down the getaway driver, Claude Davis, who confessed to driving Howard around that night. The California Innocence Project tracked down the identifying witness, who has expressed doubts about her identification of Q.T. In 2013, the California Innocence Project petitioned for clemency to Governor Jerry Brown. In 2018, Governor Brown granted clemency reducing Quintin Morris’s sentence, making him immediately eligible for parole. Morris was released on January 10, 2019 after serving 27 years in prison for a crime he did not commit.